The world is changing, and so is Far Cry. The fifth game in the main series has been revealed, and it’s rooted in far more familiar territory than previous entries: the United States of America. Sitting at the head of its antagonist table is Jacob Seed, leader of a violent and malicious religious cult that’s carved out a foothold in Montana. 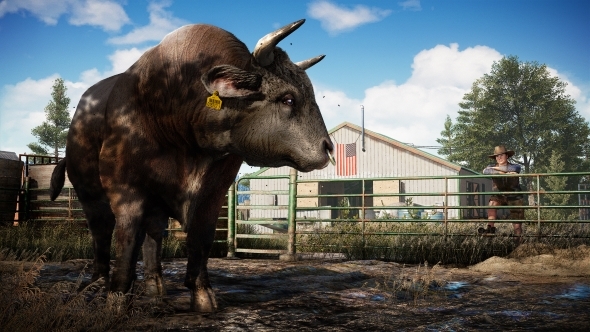 With themes that dance exceptionally close to contemporary real-word controversies, Far Cry 5 is already adding up to be one of the most interesting games of the series. Get your gun on in one of the best shooters on PC. 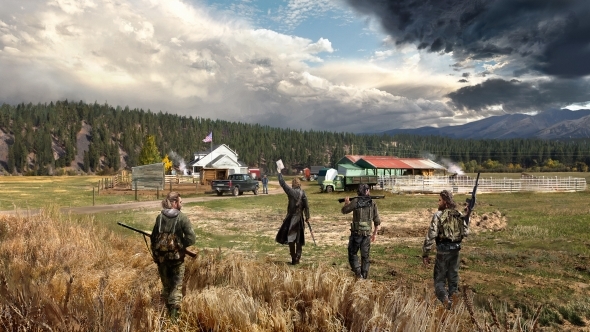 Joseph Seed, known in the region of Hope County as The Father, is the leader of Project at Eden’s Gate. It’s a religious cult, with obvious roots in Christianity, and it’s looking to grow its congregation by any means necessary. The Project’s core beliefs will be familiar to anyone who’s been following the rhetoric of America’s far-right in recent years: freedom, faith, and firearms. 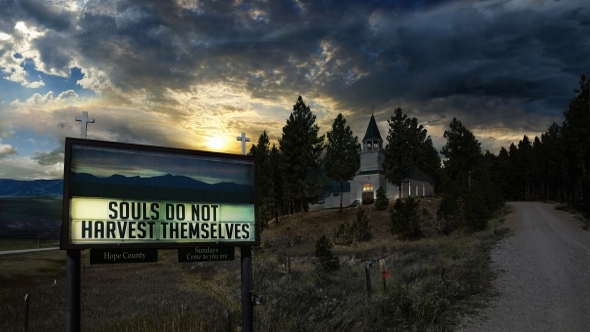 The people of Hope County are being drawn into the project, be it willingly or through forcible recruitment, and the game’s trailer suggests that Joseph doesn’t treat his congregation with much respect. Alongside Joseph sits his three siblings, AKA The Heralds. Jacob and John are his two brothers, and their half-sister Faith completes the trio.Together, the four Seed family members will make up Far Cry 5’s cast of villains. They’ll undoubtedly possess some form of magnetic personality, akin to characters like Pagan Min and Vaas from previous games in the series, but quite what form of threat each one will take remains to be seen. Not everyone in Hope County has welcomed the Seed family into their community. Those frightened or angered by the cult have banded together to form a resistance group. Among them is Pastor Jerome, a preacher whose congregation has been leached away by Eden’s Gate. Rather than remain peaceful and seek solace in God, Jerome is willing to turn to violence. “If I’m not the shepherd, I must be the wolf,” he explains in his character vignette video, while feeding bullets into a fresh magazine. No doubt he’ll prove a useful ally in the battle against Eden’s Gate. Joining Jerome in the resistance movement is Mary May, owner of the Whistling Beaver saloon. When Joseph’s cult arrived in Hope County, they took her mom and brother, leaving her father a broken man. Understandably, Mary May has a bit of a grudge against the Seed family, and will do anything she can to help you take them down. Almost certainly such help will come in the form of quests that involve hurling molotov cocktails at chapels. The final member of the resistance trio is Nick Rye, a wholesome family man who really, really loves planes. Angered by the Seed family’s actions in his home county, he’s taken to bolting a rotary machine gun to his personal set of wings in order to rain down his own form of sin on the cult. In Far Cry 5, you’ll be playing as a deputy sheriff who has been dispatched by the US Marshals to arrest Joseph Seed. You’re backed up by a couple of extra officers during the arrest itself, which is how the game opens. Incredibly, Joseph is willing to go quietly. It wouldn’t be a Far Cry game if everything went to plan, though, and one disaster later you’re stranded in Hope County alone, outgunned, with your fellow officers kidnapped by the cult. You’ll need to seek help from the resistance in order to rescue them. 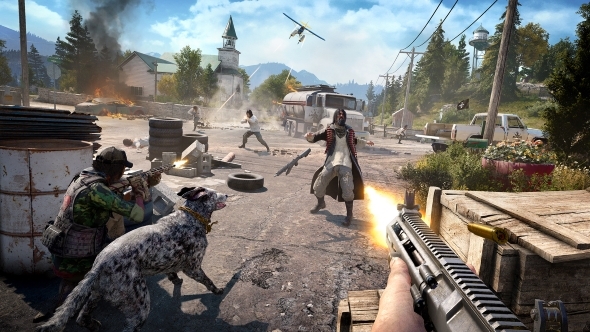 Unlike previous games in the series, Far Cry 5 won’t have a predefined central character. There’s no dudebro Jason Brody here. Instead, you’ll create your deputy with a character creator, which will allow a multitude of race and gender combinations. Ubisoft wants you to place whoever you’d like at the centre of the story. It’s already looking like Far Cry 5 will continue the lineage of the past three games in the series, what with its larger-than-life protagonists and lush, rural environment. While towers and hunting are yet to be confirmed, we do know that Far Cry 4’s Guns For Hire mechanic is making a return. This will allow you to hire NPCs – presumably from the Hope County resistance – and have them help out in combat encounters. Not content with just having human mercenaries, Ubisoft have also included a Fangs For Hire system. Similar to the animal taming from Far Cry Primal, you’ll be able to instruct animal companions to complete tasks for you. The mechanic has yet to be demoed, but it sounds like you can send bears charging into enemy encampments and have dogs drag people by their ankles. There’s one more For Hire mechanic, and it’s the one that will really set Far Cry 5 apart from its predecessors. Friends For Hire is a fancy alternative for the word ‘cooperative’. Yes, the game is entirely playable in co-op. Every mission of the game’s campaign can be played with a buddy. 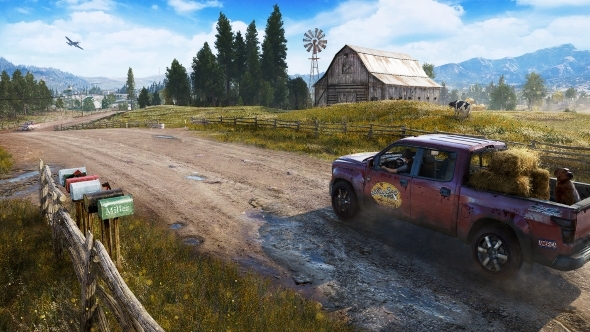 In Far Cry 5 you’ll be exploring Hope County, Montana. Being one of America’s most northern states you can expect a good variety of landscapes; lush green crop fields, heavily wooded forests, and those classic small-town vibes. It wouldn’t be the USA if there weren’t any muscle cars, so you’ll be pleased to hear that tearing through corn fields in a V8 will be a possibility. 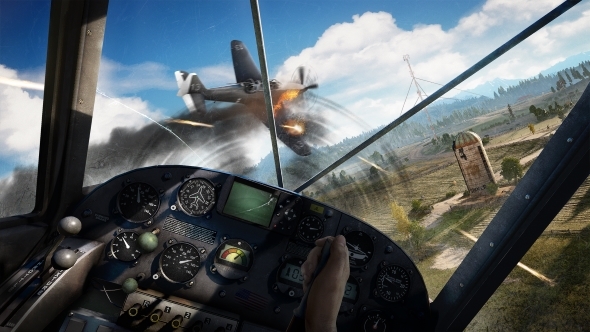 Ubisoft have also confirmed that planes will be available to fly, suggesting that this is a step-up in terms of geographical scale compared to previous games. That’s everything we know about Far Cry 5 so far. It’ll be a key feature at Ubisoft’s E3 conference in June, so we’ll know more then, and the game releases February 27, 2018. In the meantime, why not let us know what you hope to see from the game in the comments?